In recent blog posts, I have touched upon six of these sites as being recognized for most marketing programs. Facebook and Twitter are common sites for both brands and users in general providing similar yet largely different features. Instagram and Pinterest are more geared towards B2C marketing, whereas Google+ and LinkedIn serve a better purpose for B2B marketing and technology-based companies. Even YouTube has become a key component within the social media marketing world, providing an outlet for brands to launch viral video campaigns. However, SlideShare is often a forgotten social media platform despite the tremendous opportunities it provides for content marketing. While each strategy will be customized based on the targeted audience and key objectives, this graphic illustrates a sufficient overview of each social media platform’s effectiveness for marketing campaigns. 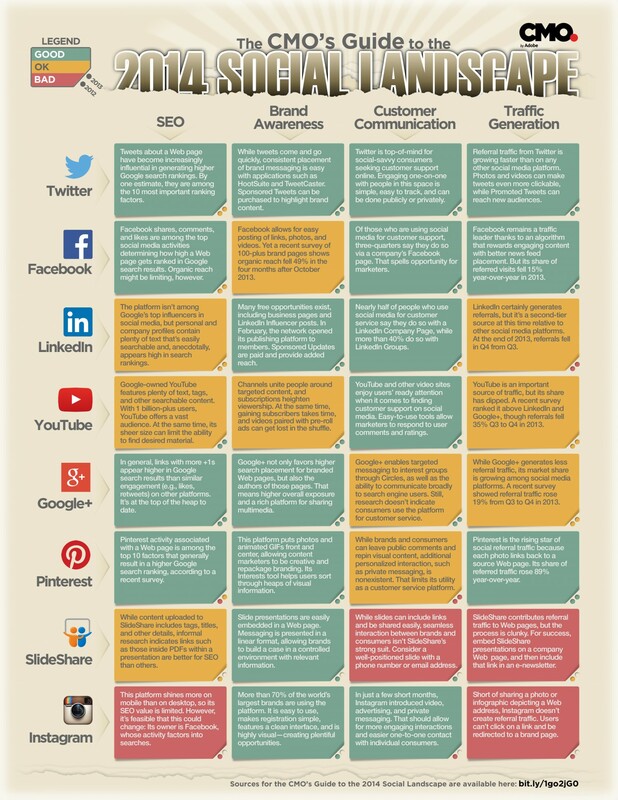 A handy social media guide is nice and thanks for sharing.